The defending team is in normal 6-5 D.
The idea of the slide is to move the goalie and defenders from one side to the other, and then back again, this will open a gap on the far side of a quick off the hand shot! Important: When sliding and faking players must look like they want to shoot. If the defenders don't move out to any shooter, the fake it into 4m or 5m and have a shot, at that range you should score! 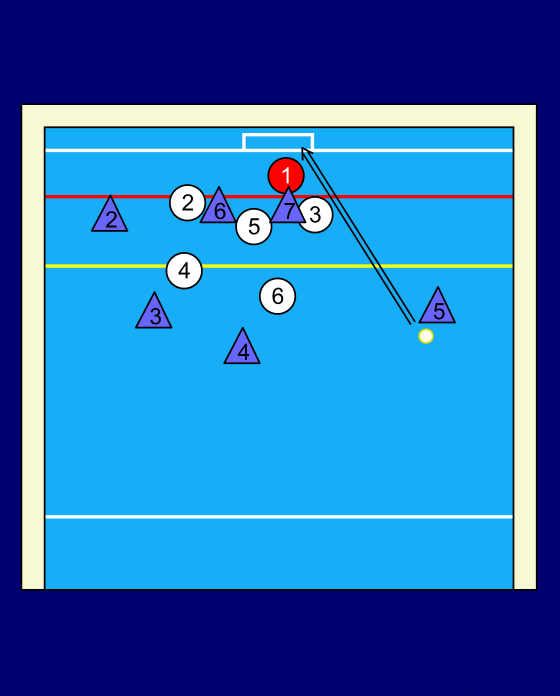 Offense 5 starts with the ball and moves down inside the 2m faking the ball. Defender No. 3 will usually walk out towards him, with an arm up blocking. Offense 4 curls around slightly. When the defender has moved out towards to him, or he has faked the ball down roughly 1m into the 2m zone, Offense 5 passes the ball out to Offense 4. At this time Defender No 5 will usually slide across to Offensive player 6, no cover cheep tap in goal. Offense 4 fakes the Ball down towards the right. Defender No 6 will usually come out towards him. Offense 3 starts to slide to the right. As Offense 4 passes the ball to Offense 3, Defender No 5 will slide back to offensive Offense No 7 on the post. Offense 3 will fake the ball while sliding right. Defender 4 will move out towards him. Offense 2 will start to curl out. When the pass goes to Offense 2, defender 5 will come across to cover the Offense 6 player on post. Offense 2 slides down towards his own 2m, Offense 3 and 4 curl round slightly. Offense 3 receives the pass and slides to the left. Defender 4 moves out towards him while blocking. Defender 5 moves across to cover Offense 7 on the post. Offense 3 slides to the right, Offense 4 also slides to the right slightly. Defender 4 moves out towards Offense 3. Offense 3 passes to Offense 4. Defensive 5 moves to cover Offense 6 on the post. Offense 4 slides to the right, Offense 5 also slides up. Defense 6 moves up to block Offense 5. Offense 7 now pushes across to the right, defender 3 should follow. If Defender 3 does not follow Offense 7 then go to sequence 17. Offense 5 receives the pass. And shoots off the hand at the near side. If the shoot is not on, Offense 5 can slide down the Offense team can slide one more time for the shot to come from Offense 2. Defender 3 did not follow Offense 7 so Offense 7 has his right arm free. Offense 5 gives a low hard pass to Offense 7. Offense 7 pop's up as high as he can and 'slaps' or 'taps' the ball, to change the direction and angle, this should make it very hard for the goaly to save, he has his right arm free and should be able to reach the ball. You can do this move from the other side starting at Offense 2 but if defender 3 does not follow Offense 7 across in sequence 12 then it is hard to 'pop' the post, unless you have a lefty in the Offense 6 spot.